It was great to sit down in the quiet of my studio and apply some of the things I learned in the workshop. I am still not sure if it is done, so I am going to sit with it for a little while to see if I want to add anything to it. I was lucky enough to participate in a workshop with Qiang Huang this past weekend. 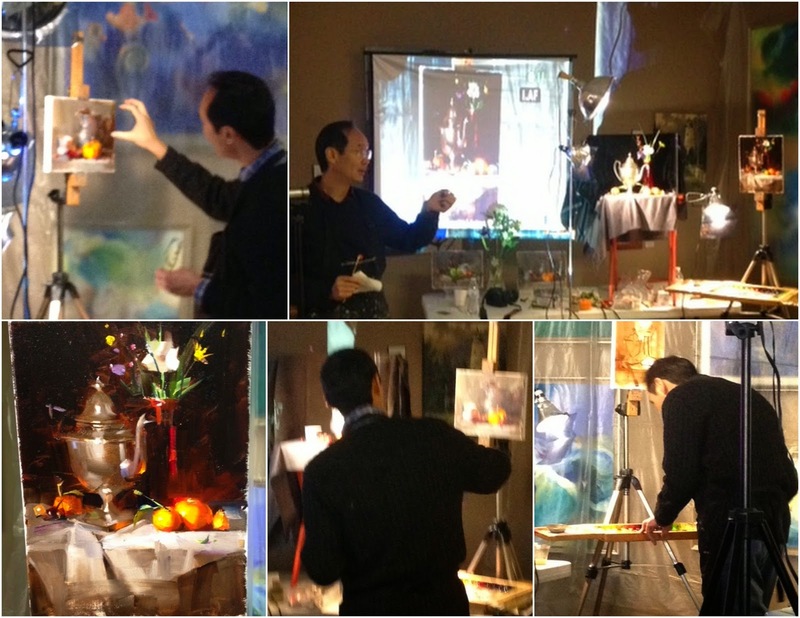 As you can see from the photos above, Qiang is an amazing artist, but he is also an excellent teacher. It was so inspiring to watch him paint, as he is so intentional about everything he does, from the set-up, lighting, props, to his brushstrokes.......especially his brushstrokes. There was so much information to absorb, I am eager to get back in the studio and apply what I have learned. Below you can see a couple of shots of the painting I did on the second day. It was difficult for me to keep the painting abstract/loose in the color stages as he does - there are a lot of bad habits to break. using Ultramarine Blue mixed with Transparent Red Oxide. The image on the right is my final painting. The "Red Barn" sketch was done in the summer. As I came upon this scene while walking in a local park, I was immediately drawn to the color of the turquoise truck against the red of the barn. I went back on another day with my easel and paints hoping the truck would still be parked in the same spot, much to my delight, it was still there. My schedule has not permitted me to paint as frequently as would like, therefore, it is even more satisfying when I finally complete one. This one is for sale on my DPW auction page. For a while, I have been wanting to do a series of figures at work, using their hands and heart to create. It seemed only natural to me that I begin with a scene from a restaurant. I grew up in the restaurant business, my dad was a chef and owned a restaurant for several years. My brother's and I chose different career paths, but my cousin Paul found his way into the business. Last March, I was lucky enough to visit his restaurant and take photos of him and his staff busy at work. This painting was a huge challenge for me as I am not comfortable with portraiture, and I don't spend a lot of time doing figure work. The background was also a challenge, I tried keeping the values close in range, and simplified the colors, with little spots of the warmer oranges to pull your eye through the painting. I could keep going back into this one, but I think I am going to call it finished. If you are ever in the Bay Shore area of Long Island, you should stop by Mulberry Street Restaurant and try the meatballs - the pizza is pretty awesome too! Since it doesn't snow much here in North Carolina, we enjoy every little bit we get. I was hoping for enough accumulation so that I could paint a snow scene and I lucked out this time. It could be a year or two before we see this much snow again, therefore, I took full advantage and I have painted the past two days - from the window of my warm home, of course. Yesterday's painting was a wiper, but made me even more determined to paint again today. There is a lot of pressure to capture something before it all melts, which makes me think of a quote by Joaquin Sorrolla - "One must paint quickly, because so much is lost, in an instant, and you never find it again." I knew I wanted to paint Dexter the first time I saw him. I couldn't resist those soulful eyes and beautiful mane. In addition to being a handsome fellow, he also has the sweetest personality and loves children. When he visits our home, he nuzzles my daughter's head, and sits in her lap. Dexter was adopted from a rescue organization and has been a wonderful companion for his owner. There are so many dogs waiting for adoption, check out www.petfinder.com. Happy New Year! It feels great to have the crazy rush of the holiday behind me as I shift my focus on creating in 2014. 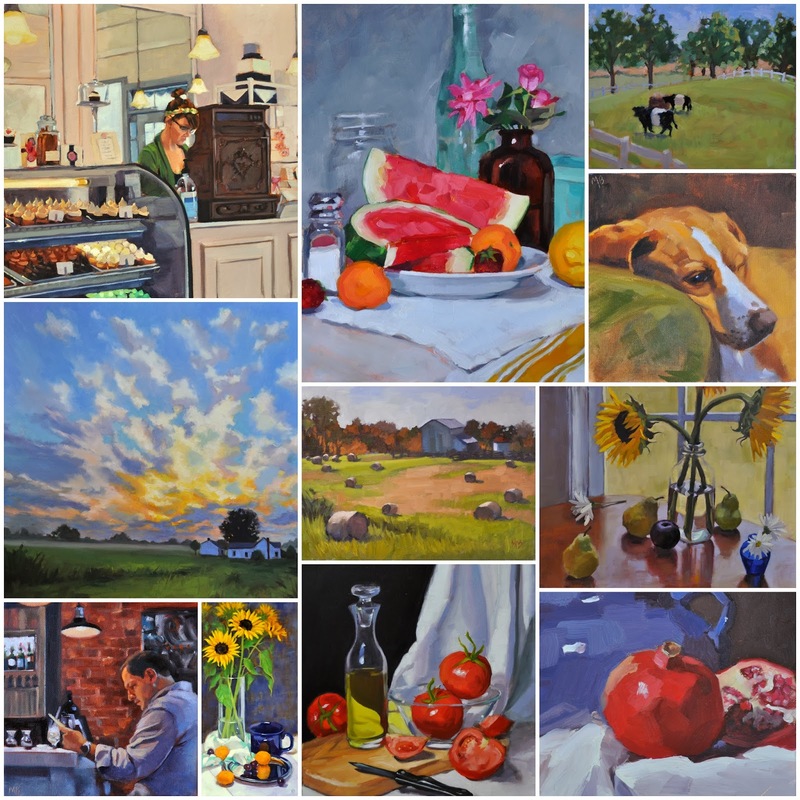 Thanks for all the support this past year, especially those of you that attended my exhibition, sent encouragement, left kind comments on my blog and Facebook page, or purchased a painting. Now that the exhibition is over, I have posted all paintings for sale on my Daily Paintworks Gallery Page. If you are interested in any of the paintings, just click here. 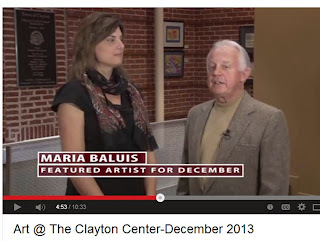 Last Thursday was the opening reception for my exhibition at The Clayton Center Gallery. A huge thank you to Clayton Visual Arts for selecting me, along with Lin Frye, as one of the featured artists this month. If you click here, you can read more about the exhibition, including my bio. I had so much fun participating in the Clayton Art and Home Tour on Sunday. It was great to have the opportunity to display my work in the beautiful home of the Stewart family. Thanks to everyone for coming out and supporting this fundraiser, in spite of the awful, rainy, and cold weather. Meeting everyone and hearing feedback about my paintings was a real treat. 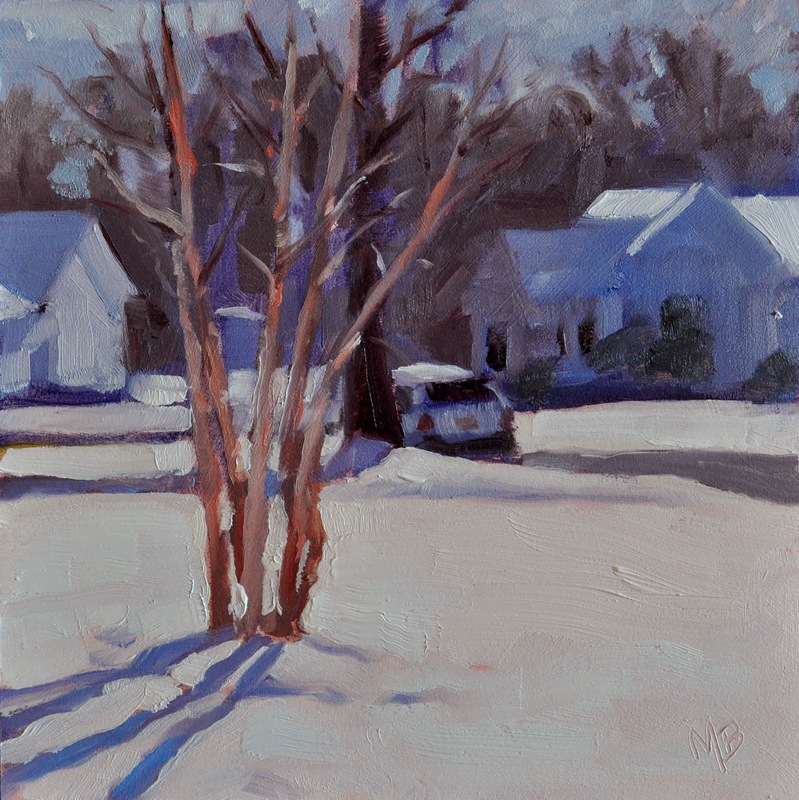 This is one of the small paintings that will be for sale at the Christmas in Clayton Home and Art Tour , which takes place on Sunday, December 8. This is the first year that I will be participating in this event and I am looking forward to it. 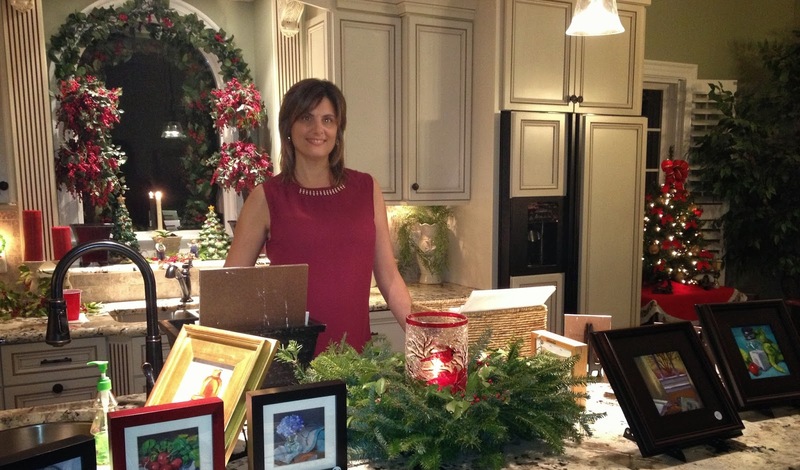 Each home will be decorated for the holidays, and each will have an artist displaying and selling their work. Musicians and Christmas carolers will be in some of the homes. Also, the opening reception for my December exhibit will be Thursday, December 5 at the Clayton Center Gallery. This one makes me happy and might turn into a series. All of these current, smaller paintings will be for sale at a local Christmas Home Tour on Sunday, December 8th. I will be posting the details of this event in the next few days on my blog and Facebook. I have always been fascinated by the inside of a Pomegranate; the seeds look like little gems. In addition to being a beautiful fruit, they are the most powerful anti-oxidant of all fruits. If you have never tried one, they are delicious, but can be time consuming to eat if you don't know how to properly peel it. However, I just came across a YouTube video that shows the correct way to peel and eat a pomegranate. There are too many powerful health benefits to pass on eating them, with their ability to lower cholesterol, blood pressure, and other cardiac risk factors. I'll be eating many more now that I know how to peel them. This one was so much fun paint, I'll be painting them more too. Here is another one for my upcoming show in December at the Clayton Center Gallery. 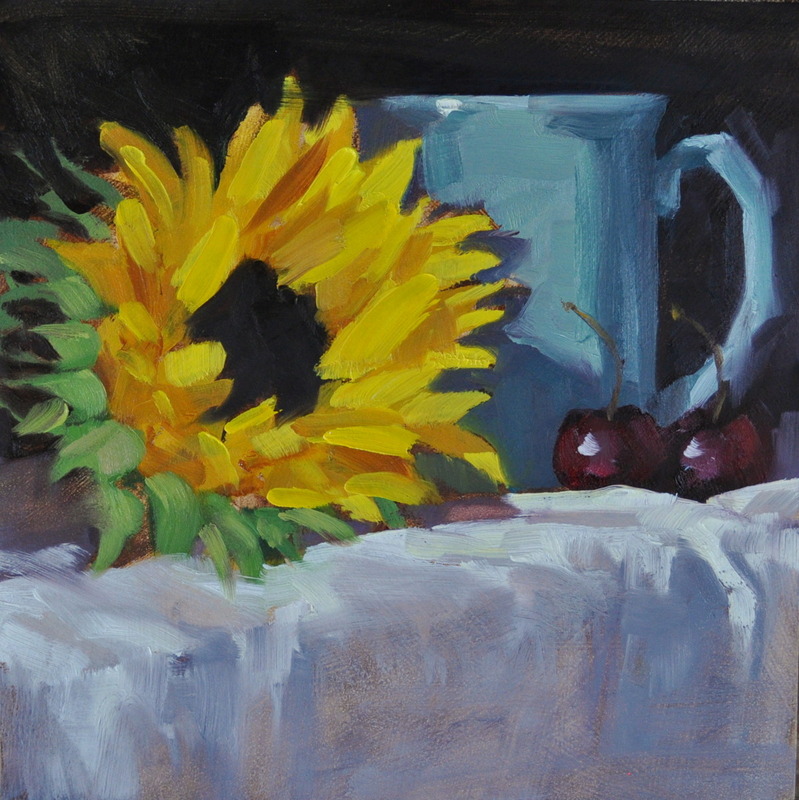 Sometimes it's nice to get back to our comfort zone....I just love painting still life. In this one, I wanted to capture the glow of the olive oil and the fleshiness of the cut tomato. Now, all I need is a crunchy loaf of Italian bread and I have the start to a great meal. The morning I saw this amazing sunrise, I couldn't help but think of God's greatness that is revealed to us each day through his Word and his creation. I have been in my studio working on larger pieces for my upcoming exhibition in December, but I did step out on a few occasions to paint outdoors. 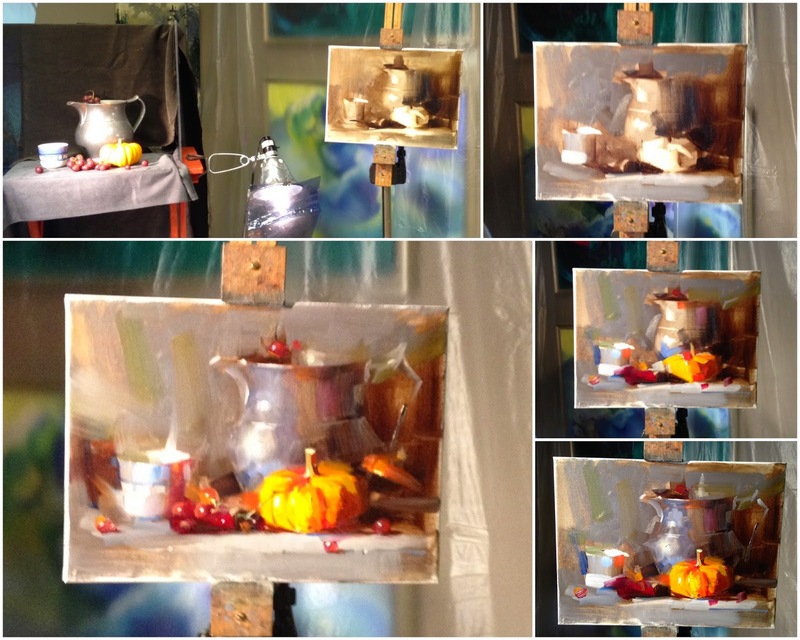 Fall is my favorite time of year, so I will be painting on location as often as possible. Last week, I drove out to Fearrington Village and painted the black and white belted cows grazing on the rolling pastures. What a treat! My sweet husband brought me a large bouquet of yellow flowers on my birthday, I pulled out this single flower for another go at simplifying the shapes of the petals while keeping it loose. Eventually, I will find the courage to paint the whole bouquet. If you are interested in this painting, click on the link above for my Dailypaintworks auction, bidding starting at $50.00. 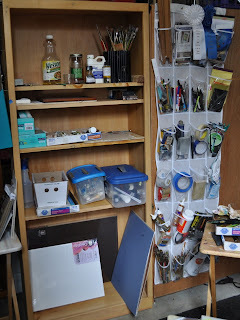 Recently, a group of blogging artists shared photos of their studio space, and it inspired me to rearrange and organize my own space, so I thought I would share it with you. There is nothing glamorous about my studio as it is housed in my garage, but I am grateful to have a space set aside for painting. 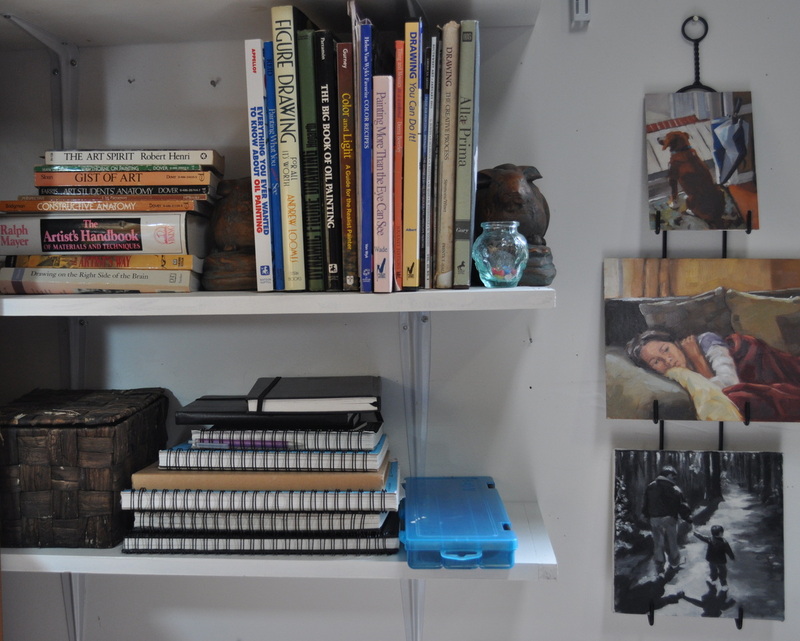 Since I am working in a small space, it is essential that I keep the clutter to a minimum. 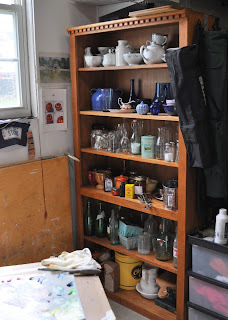 I have rearranged this space several times, trying to make the most of my limited square footage; each time purging all the unnecessary items, to help keep the chaos to a minimum. Over the past few years, I have incorporated different tools to help my productivity. As you can see, I use Carol Marine's Panel Holder on my easel for my smaller paintings; it is a great tool for keeping the panel in place, in addition to allowing you to paint off all four sides of the painting. For my palette, I typically cover a 16" x 24" piece of Masonite with grey palette paper for a large mixing area, however, for this small painting I just used the 12" x 16" Paper Palette Pad. After a long day of painting, it's nice to have easy clean up with a disposable palette. Now, if I can only hire someone to clean my brushes, it is my most dreaded chore. 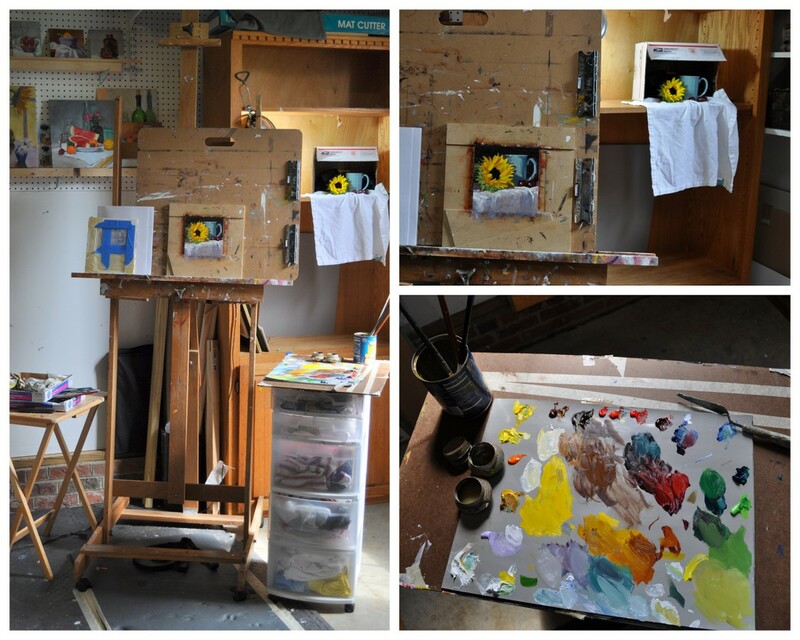 It is every artists dream to have north light in their studio, myself included, but for now I use artificial light. After doing some research, I bought a basic flourescent shop light with Lumichrome Full Spectrum Lamps to hang over my easel. For my still life set-up, I use a GE Daylight 6500K spiral bulb. 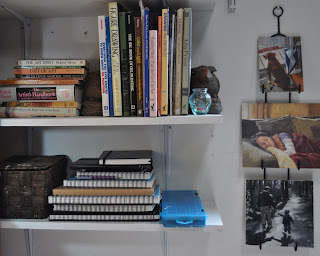 I do not have a still life shadow box, therefore, I use a large bookshelf with adjustable shelves to control the lighting and perspective of my subject. My collection of still life props is growing, as you can see I have an affinity for glass objects. I love finding new props at local thrift stores, but I am running out of space. 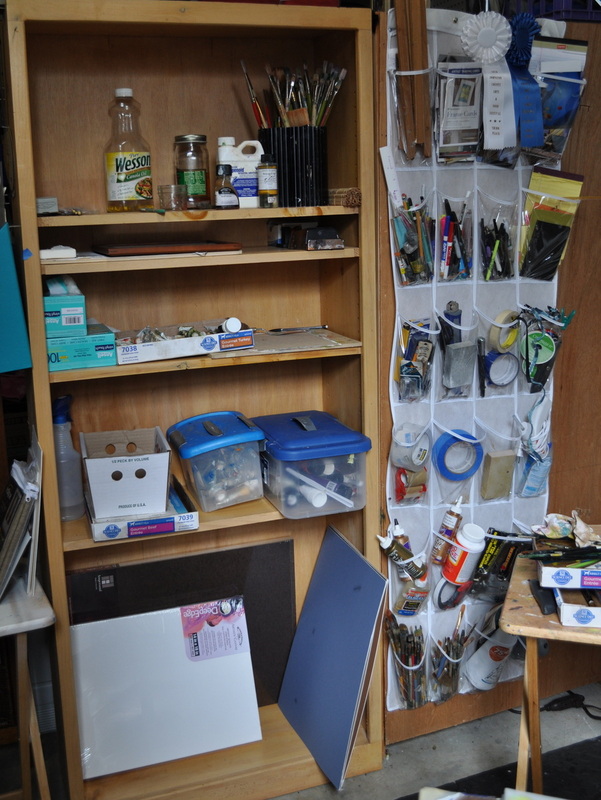 This is my supply area, I know that it would look much neater if I could put all supplies behind closed doors, but I like having easy access and visibility. I use a hanging shoe bag to store some items that I use frequently. Over the years, I have collected a good amount of art books that take up a lot of space, so I decided to have my favorites within arms reach, and place the rest elsewhere. Thank you for taking the time to visit my studio. Nothing is more refreshing than a slice of cold watermelon in the middle of summer; I love painting fruit, but watermelon is one of my favorites. I spent a lot of time arranging and rearranging this still life trying to create variety in the color, value, and texture. 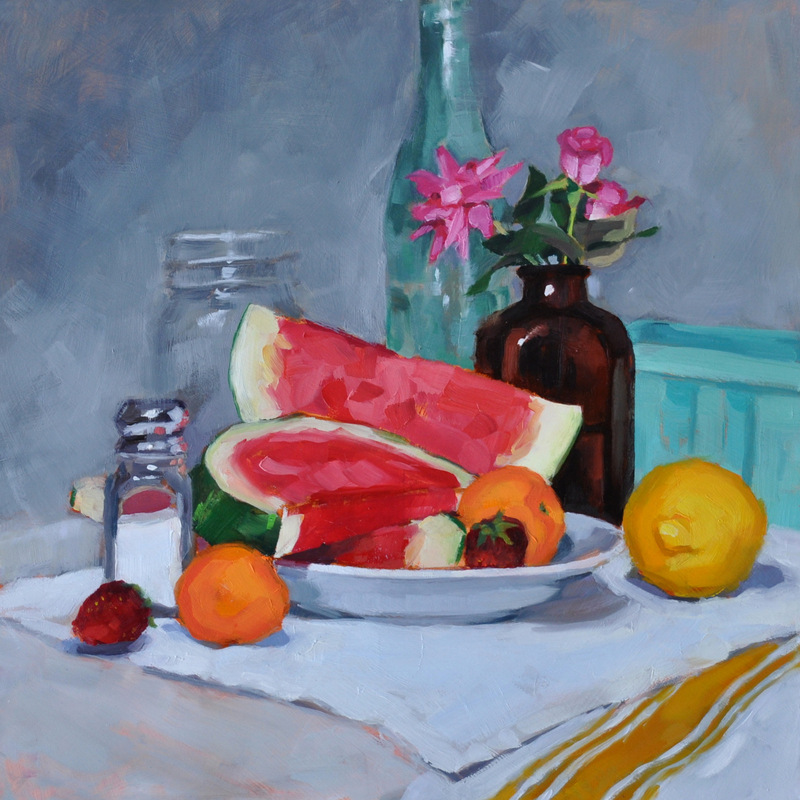 I love when a painting has mostly light, or middle value tones with one dark object like the brown, glass bottle in this one. 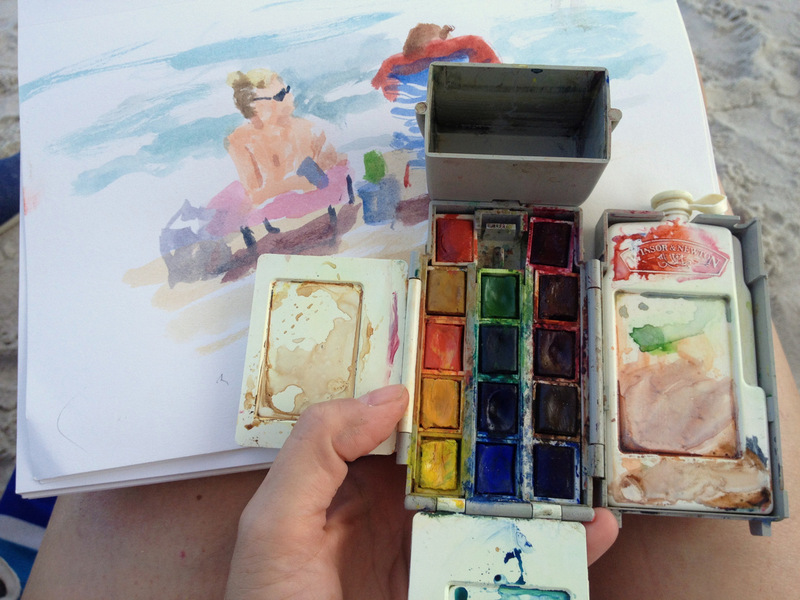 I was glad to paint my favorite salt shaker too, but the question is - to salt, or not to salt? Recently, I cleaned out my studio and reorganized the mess that had accumulated over the past 6 months discovering all kinds of things that I had forgotten about, including this Winsor & Newton Water Color Field Box. I purchased this set over 20 years ago, and as you can see I never really used it much. The set is small enough to fit in the palm of my hand, with 2 palettes, a water container, a water bottle, and 14 colors. I am hoping to use it more often, especially at the beach.